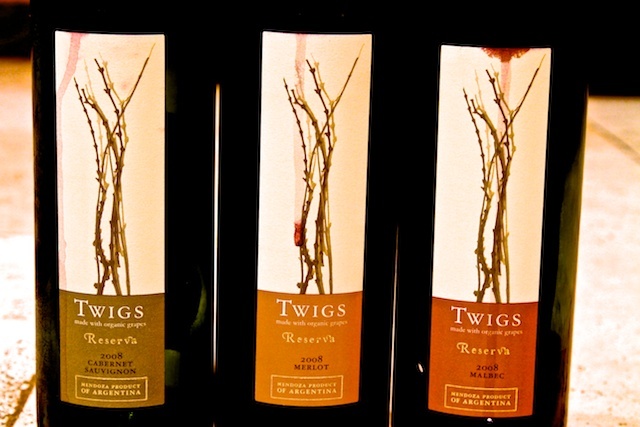 Twigs Organic Wine’s 2008 releases feature a Cabernet Sauvignon, a Merlot and a Malbec. All are certified Organic by the OIA, an organization which is accredited with the USDA. Although the Twigs name is new, the family behind the wine is not. The Cecchin family has been farming grapes for 100 years, in the traditional way- with horse tilled fields and without the use of fertilizers and pesticides. Originally from Italy, the Cecchin family put down roots in the Maipu region of Argentina and in 1959 they founded the wine company Bodega Familia Cecchin. All three wines are almost identical in style. Uncomplicated, fruit forward, light on the alcohol and unoaked. At $14.99 the wine is a decent value. I think if it you can find it for under $10 it would be an exceptional value.